Posted August 21, 2013 by Josette Farrell in Sport. 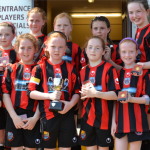 Claregalway/Lackagh U12 Girls soccer team competed in U12 Girls seven-a-side outdoor Soccer competition at Community Games Nationals Finals in Athlone IT on Saturday and Sunday 17th and 18th August. Back L-R: Rosanna Martyn, Chellene Trill, Medb Mc Carthy, Emma Slevin, Kate Slevin, David Flaherty (Coach). 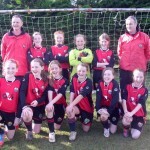 Front: L-R: John Donovan (Coach), Clodagh Grealish, Niamh Mc Grath, Sinead Murray, Sinead Donovan (C), Rhiann Heery, Leanne Frawley, Rosin McCarthy. On Saturday 17th, a semi-final match versus a much fancied Listowel Team (Munster) was contested by both teams to the enjoyment of players, supporters and officials. Early saves by Rosanna Martyn in the first half, coupled with rock solid defending from Sinead Murray and Medb McCarthy, built confidence right through the team. 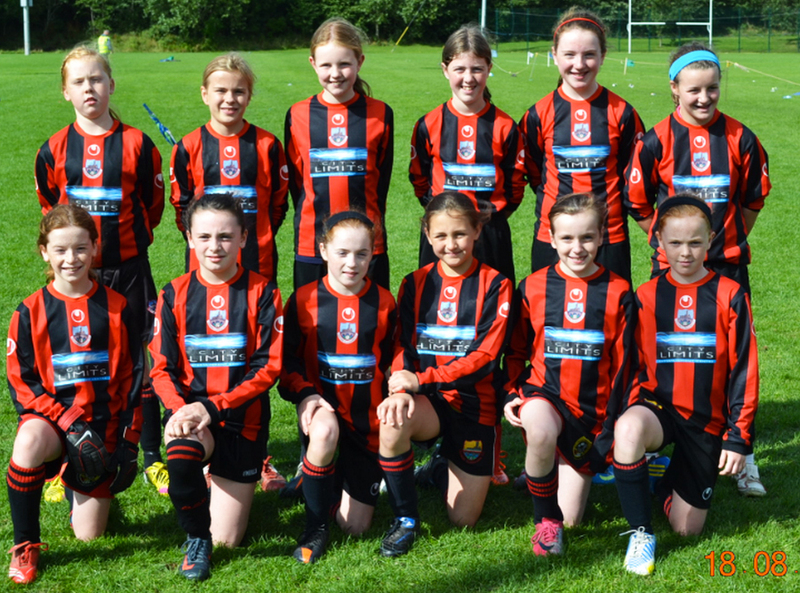 Constant running up front by Roisin McCarthy and Leanne Frawley caused upset in opposition area during first half. Claregalway/Lackagh took the lead just eight minutes into the first half when an in-swinging corner from the very impressive Sinead Donovan was deflected into the net last, touching a Listowel defender. The rustiness of 2 months layoff playing competitive soccer was showing in Claregalway/Lackagh as they continued the remainder of first half and into second half of game creating multiple chances but failing to score an allusive second goal to secure the game. This proved costsly as 2 minutes into injury time in second half, Listowel scored an equaliser. As ten minutes-a-side extra time loomed, Claregalway/Lackagh continued to make the better chances while Listowel remained dangerous and excellent on counter attacks. Four minutes into second half, a cross was handled in Listowel area and the resulting penalty was dispatched to back of net by Sinead Donovan. The game was closed out with very impressive team display by all players. On Sunday 18th, Claregalway/Lackagh were playing the final versus Fanad Utd from Donegal, who were runner-ups in this competition for the last 2 years. Both teams served up a superb game of football with chances for both sides in early minutes. As the game settled, Claregalway/Lackagh started to take control of the game. Clodagh Grealish in goals was a safe pair of hands swallowing up any danger in close proximity, while Niamh McGrath with a goliath performance in centre of defence saw off multiple attacks and set up counter attacks with long kicks out of defence. Tactics came into play with Chellene Trill, marking Fanad’s most dangerous player, was immense in text book demonstration of marking a single player during game and removing main source of attacking in Fanad team. The midfield engine room led by Sinead Donovan and Rhiann Heery was the significant edge that was evident in the first second to the last second of both games. The ground covered in both defending and attacking was a joy to watch and both girls rose to the occasion leading by example. Sisters Kate and Emma Slevin were instrumental in cementing midfield control and attacking Fanad goal. A corner after twelve minutes resulted in a carbon copy of goal scored in semi-final the previous day. Sinead Donovan curled over a cornerkick which deflected off an opposition defender at front post and into the goal. A first half played with free flowing football ended with Claregalway/Lackagh on top. The second half of final was as entertaining as first with both teams making end to end attacks and defending resolutely. In the final ten minutes of second half, a superb Rhiann Heery corner was volleyed by Sinead Donovan only to hit crossbar and the score to stay at one nil. Unbridled joy at final whistle for players, parents and supporters was a sight to behold and Claregalway/Lackagh creating history being the first team to win this competition in a seven-a-side format and bringing gold home. 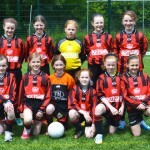 Back L-R: Clodagh Grealish, Rosin Mc Carthy, Sinead Murray, Sinead Donovan ( C ), Niamh McGrath, Rhiann Heery. 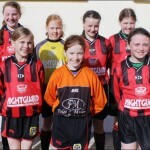 Front: L-R: Rosanna Martyn, Leanne Frawley, Emma Slevin, Chellene Trill, Medb McCarthy, Kate Slevin. 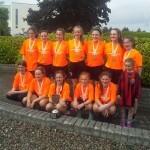 Niamh McGrath, Sinead Donovan and Rhiann Heery made this their second National title in as many months as the three girls were also part of Claregalway/Lackagh U13 Indoor Community Games team who won earlier this year. 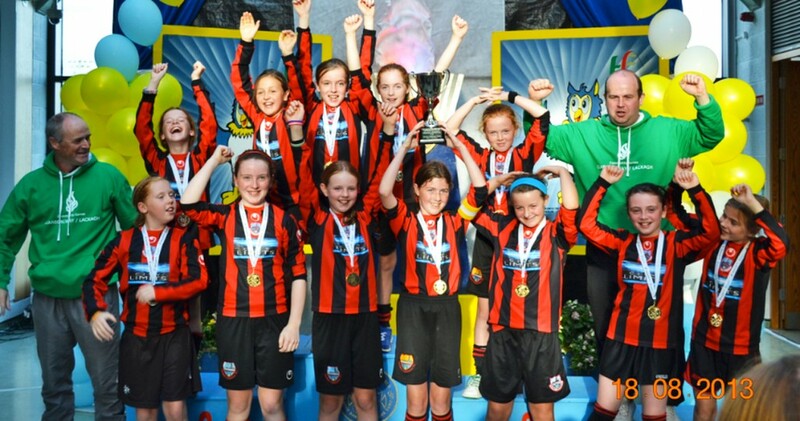 Having one title in a year is special and having 2 gold medals is a massive achievement for all three girls—all players play regularly with local soccer club Cregmore Claregalway FC. Many thanks to players, parents and families, supporters and Claregalway/Lackagh Community Games committee who supported team every step of competition. It is also our thanks to players, management and supporters who attended hurling final who also supported girls after hurling final ended and we wish hurling team our congratulations in their fantastic result. We are indeed a community blessed with very talented players, several of whom remain eligible for this competition next year!